Observatory in conjunction with a simple air shower trigger. The array operated at 44 MHz with 2.75 MHz bandwidth. Out of 4,500 triggers, a clear bandwidth-limited radio pulse was seen in 11 events. This corresponded to a cosmic ray trigger threshold of 5×10^16 eV and was of intensity close to that predicted. This has been further confirmed by many other experiments over the years and is now currently used in many well-known projects such as LOFAR and at the Pierre Auger Observatory. Cosmic rays are known to initiate a cascade of particle collisions in which large multiplicities of secondary particles of all kinds are produced. In the creation and annihilation of these secondary particle air-showers of charged particle are produced and travel down through the atmosphere near the speed of light to the ground. A large part of these charged particles consist of electron-positron pairs which emit a radio signal as they are deflected by the Earth’s magnetic field. This process is known as a geosynchrotron emission. Radio signals produced are in the region of 10-100 MHz where most power received is at the lower frequencies due to coherence effects and so the spectrum begins to fall off at around 50 MHz. However due to short duration of the radio pulse typically less than 10nS it becomes increasingly difficult to measure at low frequencies and so most observations of cosmic ray induced radio emissions are made between 40 and 60Mhz. Further due to the relativistic motion of these radio emissions they are concentrated into a beam in a forward direction so the footprint of the radio signal is concentrated around the particle shower by only several hundred meters. This makes the method of particle showers detection an ideal companion for other traditional particle shower observations by providing reinforcing information about the trajectory and energy of the incoming shower. 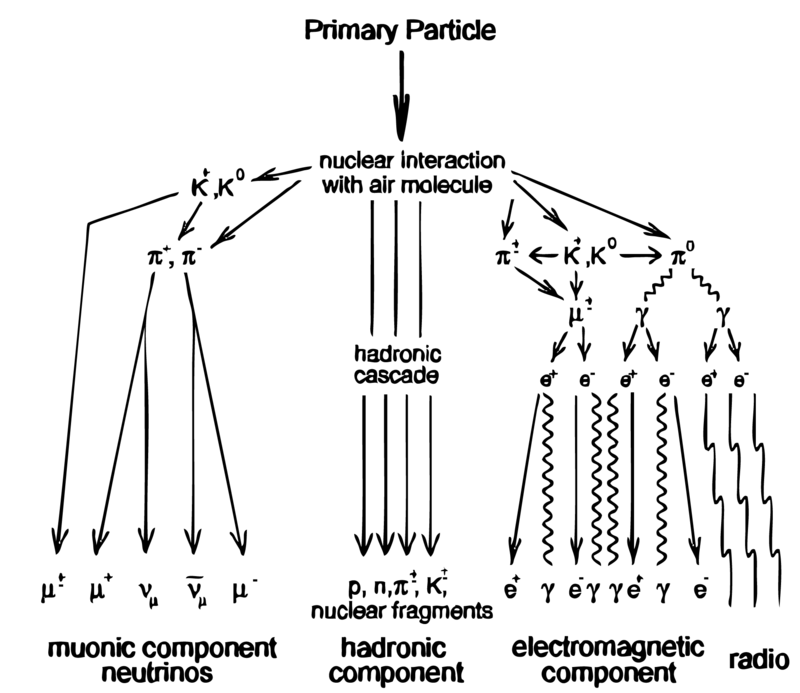 As the number of particles in the air shower and peak radio signal correlate with the energy of the original primary particle and so the radio emission increases with the angle between the particle showers trajectory and the Earth’s magnetic field. Error: Error validating access token: Session has expired on Wednesday, 23-Jan-19 16:38:21 PST. The current time is Saturday, 20-Apr-19 13:57:11 PDT.